The Australian Government listed the Wamberal Lagoon Nature Reserve on the Register of the National Estate (Place File No 1/10/052/0015). Wamberal Lagoon Nature Reserve comprises an area of coastal lagoon and associated Holocene sand barrier, which is covered by a range of vegetation types. These include reedbeds, sedgeland and shrubland and low open forest enriched by the occurrence of littoral rainforest elements. It constitutes an important habitat for fish, molluscs and crustaceans and is a rare remnant of the area’s former vegetation prior to extensive suburban development. The reserve contains a population of the endangered brush cherry, (Syzygium Paniculatum). The convolvulaceous species Wilsonia Backhousei is recorded at its northern limit within the reserve. Wamberal Lagoon also furnishes a significant and uncommon habitat isolate for a range of migratory waders protected by international agreements and for some waterbirds including rare and cryptic rails. Wamberal Lagoon also serves a function as a recreation amenity and breathing space for this rapidly expanding region of the central coast. The reserve encompasses Wamberal Lagoon itself and its associated Holocene sand barrier together with beach and rock platform. It is characteristic of a sequence of Holocene coastal landforms and their associated vegetation which have been totally transformed by residential expansion. The reserve is bounded by the ocean for 1.5 km on its eastern margin and elsewhere by built up areas, which are also largely associated with the relatively recent phase of rapid siltation of the lagoon. Wamberal Lagoon Nature Reserve contains a range of coastal systems, which are mixed in an indistinct mosaic of communities and structural types together with the aquatic communities of the lagoon itself. 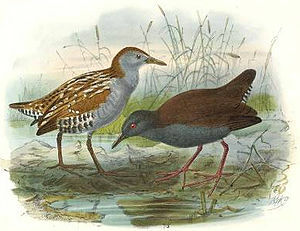 rails (eg, Rallus Philippensis and R. Pectoralis, and spotless crake, Porzana Tabuensis). The reserve has a rich and abundant bird fauna. While no authoritative vertebrate inventory for the reserve is available, ringtail possums (Pseudocheirus Peregrinus) are abundant within the reserve and it is expected that some small native mammal populations would survive. The reserve serves a range of functions such as foreshore and catchment protection, coastal vegetation and lagoonal ecosystem conservation as well as important recreational breathing space for residents of the suburban sprawl of the Central Coast.